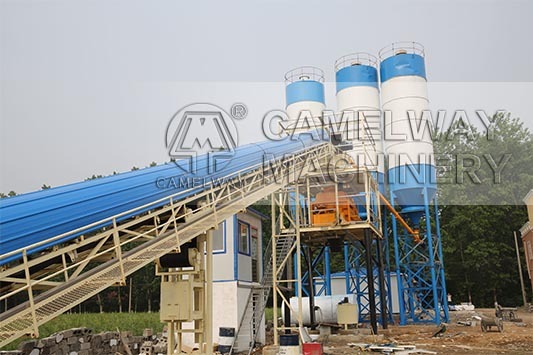 Concrete mixing plant is one of the main products of our company. In order to let everyone know our goods, in the content below, we briefly introduce our batching plant characteristics. If you are interested in this respect, just look at the following content. First, take up less space. Second, low wear and tear. Third, low energy consumption, less amount of installed power, a few raw materials evenly into the blender and easy to mix evenly. Fourth, use and maintenance cost is low: less structure link, belt short, smooth operation. Fifth, the operation of host is stable : raw materials in a relatively long period of time evenly into the blender. No intermittent feeding process. Sixth, products into the car smoothly: concrete in a long period of time evenly into the car, no intermittent discharge process. Zhengzhou Camelway Machinery manufacture is one of the large-scale enterprise specializing in construction machinery. If you want to know more information about our products or buy it, we will supply for you the best quality goods and service.